Now that you’ve searched through hundreds if not thousands of house plans for your perfect dream home, it’s time to decide about finishes for inside that new home plan. One of the most important rooms in the home is the kitchen, and a crucial element there is the floor. There is a lot to choose from when deciding on flooring material: traditional tile (whether ceramic, porcelain, or stone), wood, vinyl, or a more off beat choice like cork. What kind of floor best fits your lifestyle? We look at the most popular choices available and describe them in detail, then present the circumstances under which the material makes sense in your own great kitchen design. When you can match up the circumstances to your lifestyle, you can be reasonably sure the flooring is right for you. This kitchen in a 2-bedroom, 2-bath Country style home plan uses an unusual combination of wood and stone to create a one-of-a-kind floor (House Plan #163-1052). Vinyl flooring part of a class called resilient flooring. It – along with cork, which we will cover later – is the softest flooring choice, especially sheet vinyl. If you spend a lot of time in the kitchen cooking for a large family, vinyl is forgiving, making it easier on your leg muscles and your feet. It is also forgiving if you drop a breakable item like a glass or platter: there is a good chance the item won’t smash to pieces. Vinyl is a versatile, economical option. It comes in a wide range of colors and patterns that mimic stone, ceramic, and even wood. Unlike the floors of even a few years ago, today's vinyl features better textures and colors for a more realistic appearance, thanks to improvements in the manufacturing process for the surface. The surface is molded from engravings of the materials the vinyl is meant to imitate, and it is this engraving, or rotogravure, process that has improved the enable the vinyl to mimic the textures of slate and other stone, wood, and even leather. Most vinyl products comprise four layers: a protective urethane top coat, a clear vinyl layer (which is also protective), a printed design layer, and a felt or fiberglass backing. It is a durable surface that is designed not to stain, scratch, or fade. Vinyl – especially luxury styles – can withstand spills, kid traffic, and pet wear and tear with ease. The best vinyl brands offer guarantees on the wear layer of 10–15 years, and a good quality product should last 20 years or more. With proper preparation, you can install vinyl over virtually any flat, dry, clean surface. In most cases, manufacturers recommend installing a plywood underlayment for the best results. To keep vinyl in good condition, wipe up spills immediately. Sweep, dust, or vacuum it regularly, and occasionally wipe the surface with a damp mop. For glossy floors, occasionally strip and reapply polish as necessary. Avoid waxing or buffing the surface. Sheets offer a seamless look and come in a variety of colors, designs, and patterns. Depending on the size and layout of your kitchen, however, you may have seams. The standard width for sheet vinyl flooring is 12 feet. If your kitchen is wider than that, then you’ll have seams, which can trap dirt if they aren’t tightly bonded and allow moisture to penetrate the subfloor. Tiles emulate ceramics and can be arranged in any pattern. Some manufacturers now offer vinyl tiles that can be used with color-coordinated grout, making them look even more like tile. Planks look like hardwood, leather, and other materials with realistic colors and textures. Vinyl planks can mimic distressed surfaces or exotic species, and have beveled edges for a more realistic look when installed. • You are not big on maintenance and want a floor that is easy to keep looking good without a lot of work. • You spend a lot of time in the kitchen preparing and cooking meals for the family – and cleaning up when (if) your spouse doesn’t pitch in! 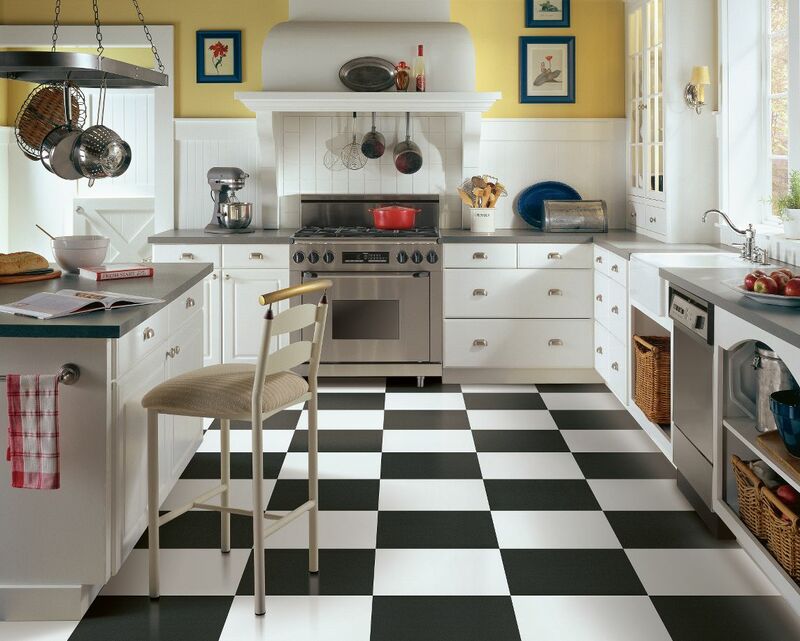 These checkerboard vinyl tiles in a classic kitchen design make a great design statement, are affordable, and will stand up well to years of use if well taken care of. Tile is a hard, tough material that can withstand heavy foot traffic and spills – and it doesn't absorb odors or bacteria. It can stand up to everything pets and children can throw at it, and it can go with just about any style decor. The hardness that makes tile so desirable as a durable kitchen floor can also be a drawback. It is not resilient, so serious cooks will want to wear comfortable shoes or put down cushy floor mats or area rugs because standing on tile for long periods of time can be tough on their leg muscles, feet, and backs. Floor mats will also prevent the possibility of slipping in areas like in front of the sink where water spillage is a possibility. Tile’s surface is cold to the touch of bare feet, and dropped dishes, mugs, and glasses will shatter on impact. Tiles are manufactured sections of durable material like ceramic, porcelain, stone, metal, or glass. The ultra-hard surface won't ordinarily be damaged by pets or kids, and it withstands stains from spilled food and liquids – though some tile and certainly any grout requires proper sealing to withstand the “liquids” part. To maintain a tile floor, wipe up spills immediately to avoid staining grout. Sweep or, preferably, vacuum the floor surface regularly, and occasionally wipe it with a damp mop or cloth. Avoid abrasives such as steel wool and scouring pads. Reseal stone floors (and grout with any tile floor) as necessary. Ceramic is made from clay. It may have a porous surface (not good for a kitchen) or a glazed surface that is fired in a kiln and made impervious. Ceramic tile is easy to install but slightly more prone to damage than porcelain. Porcelain is made from sand and minerals, and unlike ceramic tile, the color normally goes all the way through the tile. Porcelain is harder and denser than ceramic tile, and it’s water resistant. But it's also harder to install. Because it is dense and impervious, it may require a special setting adhesive for the tile to bond to the surface to which it is being applied. The tile is harder to cut, requiring a diamond wet saw whereas ceramic tile may be cut using a score-and-snap tile cutter (though a diamond saw is the best). Stone is beautiful and durable, but it requires sealing and is the most expensive of the tile materials. Depending on the stone, some of the same installation drawbacks as porcelain tile apply. Be forewarned that tile must be installed on a subfloor that is smooth, flat, rigid, and clean. Depending on the existing subfloor, a cement-based tile backer board may be required beneath the tile. • You are more traditional and like the look of stone or more conventional patterned tile installations. • You want a durable floor that will last decades without showing signs of wear. The white tile floor in my home, for example, looks new after 22 years of daily use and abuse. The stone-tile floor in this kitchen of a 4-bedroom, 3-bath, 2 half bath European style luxury home plan matches the color and texture of the rest of the stone appointments in the room (House Plan #134-1326). And it will look good for decades! Wood flooring basically comes in three types: laminate flooring, engineered wood flooring, and solid-wood flooring. Though made from wood products, laminate products aren’t really wood flooring. The top wear layer is a kind of hard, durable plastic – some manufacturers use melamine – and the core of floor is made from plywood or compressed wood fiber. Laminate cannot be sanded and refinished like other wood floors. Engineered wood flooring has a top layer of wood veneer that is coated with multiple layers of urethane for durability and wear resistance. The veneer may be just about any wood species you can imagine. The core of the product is cross-laminated plywood with between three and five or more layers. The result is an extremely stable product that resists expansion and contraction and – importantly – warpage. Although the surface should remain in good shape for many years, there may come a time when the floor will need to be refinished. You can can do so one or two times before wearing through the top veneer layer. Solid-wood flooring is usually ¾-inch-thick planks or strips of wood that is nailed to the subfloor. 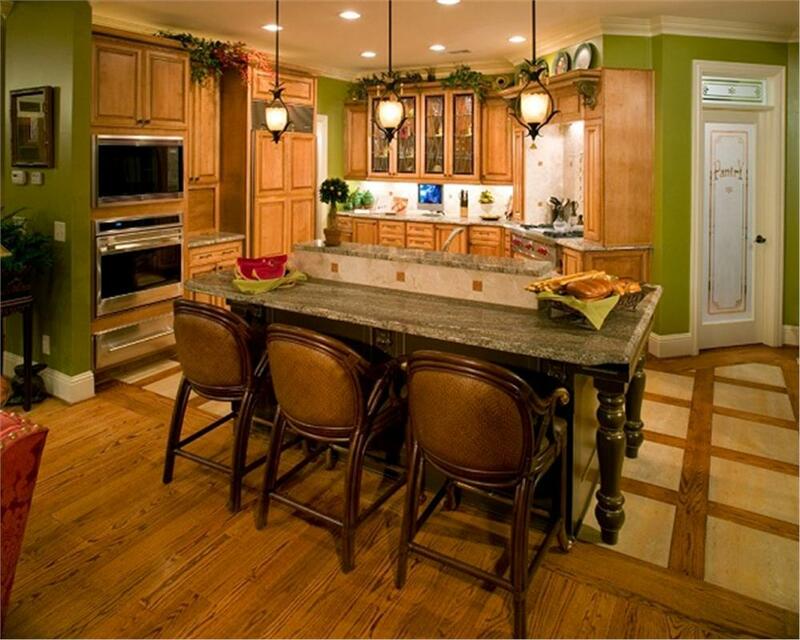 You can buy almost any species of wood, but hardwoods are most desirable in a kitchen setting. Bamboo is perhaps the hardest wood floor you can buy – and arguably the most “green” – and deserves a look if you like its appearance. Vertical-grain bamboo looks the most like conventional wood. Depending on the finish and how many coats are applied, wood floors can withstand many years of use. But the good news is that they can be refinished many times, so a wood floor can provide decades of use. Prefinished floors – whether engineered or solid wood – with factory-applied urethane finishes in up to seven coats, while the most expensive option, may be the most durable and make the most sense in a kitchen. • You have an open floor plan in your home. These days, with the popularity of open floor plans, this is an important consideration. When the kitchen is open to the great room (family and dining areas) it is an advantage to have a continuous floor throughout the space, and wood flooring does that. • You are looking for durability. Factory-applied finishes may be the best option for durability, and a tough-wearing wood like maple or bamboo will avoid dents and dings in the floor surface. Engineered wood is the most stable; solid wood can warp if water seeps into cracks or spaces that may open over time between slats or planks. • You don’t want the kitchen to look dated in a few years. Wood flooring in the kitchen has a long history, and it will always look at home even as appliances and cabinets go in and out of fashion. 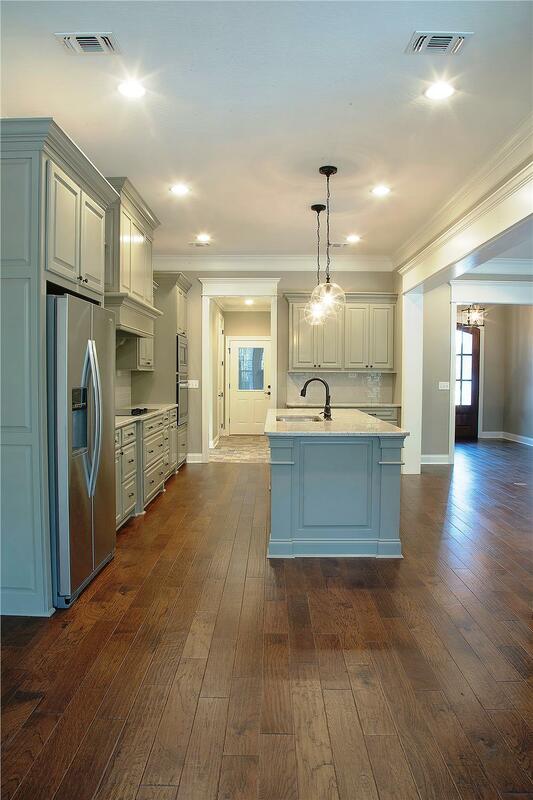 The perfect flooring for the kitchen in an open-floor-plan 3-bedroom, 2½-bath Country style home plan, this wood floor reaches from the entry through the kitchen and into the family and dining areas – not visible here (House Plan #142-1149). Though you may not think of cork for a kitchen floor right off the bat, it is actually a flooring material that deserves some consideration. Cork is made from tree bark that is harvested every eight to 10 years. It’s also a sustainable material: the bark grows back and can be harvested repeatedly. Some cork flooring is actually a byproduct of the manufacturing process for cork stoppers used in wine bottles and other containers. The material, whether direct from the tree or left over from stoppers, is ground, mixed with resins, and cut into flooring material. It straddles the line between resilient and engineered floor categories. 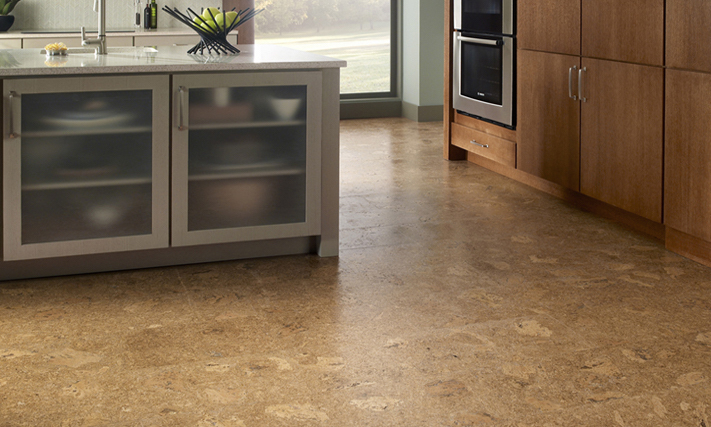 Cork is waterproof and compressible, which makes it a comfortable, moisture-resistant choice for a kitchen. It comes in 12-inch-by-12-inch tiles and 1-foot-by-3-foot planks, among others. For the comfort-conscious, cork is a great floor: its inherent softness and springiness makes standing for long periods much easier on backs, legs, and feet. And if you drop your favorite soup tureen, chances are it will bounce rather than break. A natural insulator, cork is warm underfoot, muffles sound, and helps reduce energy bills. Cork flooring can be installed—glued or floating—over flat surfaces, including wood and concrete. A plywood underlayment that’s at least ¼ inch thick is recommended and required when installing over existing floors. Cork planks snap together fairly easily for a floating installation. Tiles, which can be used to create patterns, must be glued and so are more difficult to install. To keep cork looking good over time, wipe up spills immediately. Sweep or vacuum regularly, and occasionally wipe the surface with a damp mop. Keep cork floors free of dirt and sand, as the granules can scratch the surface over time. Some cork floors come prefinished, while others are finished on site. Note that cork floors need to be resealed every three to four years to help guard against scratches and prevent moisture from entering the seams between tiles. Both natural wax and polyurethane are good sealers for cork. Refinish the flooring when signs of wear appear. • You want a flooring material that makes a statement. Cork does that on two fronts. Decoratively, cork is not that widespread, so it has an unusual look that visitors will find intriguing; it can also blend with almost any decor. Ecologically, cork is perhaps one of the most eco-friendly flooring materials you can buy besides bamboo. • You are looking for slip resistance in a flooring material. Cork presents a natural texture that does not become slippery even when soaking wet (and it’s naturally water resistant). • You prefer a floor that is soft underfoot. Perhaps even more than resilient tile, cork is a cushy floor. Because of cork’s natural compressibility, dishes and glasses are likely to bounce when dropped and you will notice its springiness when you walk on it, making it perhaps the most comfortable floor you will find. You wouldn’t know it by looking, but this cork kitchen floor is soft underfoot, so it is comfortable and breakage will be minimized, and it blends in with the contemporary vibe of the decor. Having the right kitchen floor for the way your family lives may go unnoticed – but that's a good thing! That means it suits you. It will ensure that you are happy with your kitchen over the long haul and that your resale value will remain high because the floor will remain good-looking through the years. 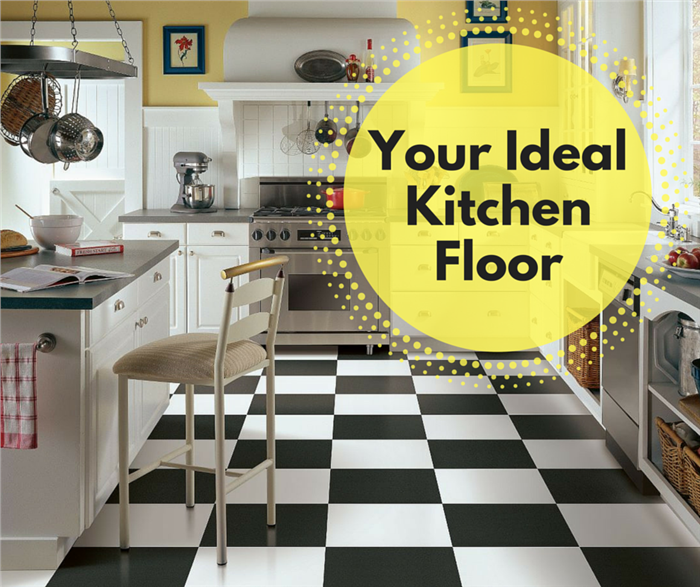 Share your thoughts and experiences with your kitchen floor in the comments section below.